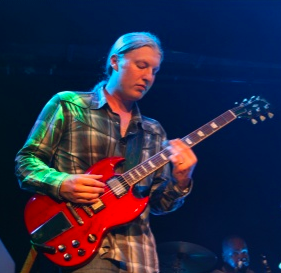 Derek Trucks of The Allman Brothers Band, the Derek Trucks Band and other projects plays a Gibson Custom Shop reissue '61 cherry SG with classic '57 humbuckers, a Vibrola cover with stopbar tailpiece and with the pick guard removed for "better tone". "Early on I loved the sound of the Gibson Les Paul, but it was just too heavy for a nine-year-old. The SG gave me a similar sound without all the weight. I also saw a picture of Duane Allman with an SG and that look has always stuck with me." 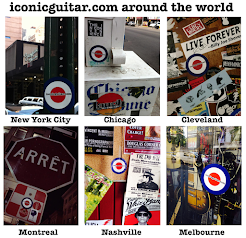 "I have seven Gibsons right now, including a 1960's 335, a 1950's ES-250, and a few SGs. I play a Gibson Custom reissue on stage, and that’s what I feel most comfortable traveling with, but my prized possession is an original 1961 Les Paul SG. If anyone has any extra ’61s lying around let me know!"